I didn’t really need an excuse to make these cookies, but I had one. The Girl Scouts were meeting at our house and naturally they expected a snack. Or at least that’s what I told myself when I stumbled upon Candy Corn Hershey’s Kisses at Target. The fact that there was a cookie recipe on the back just sealed the deal. The cookies were a smash hit. 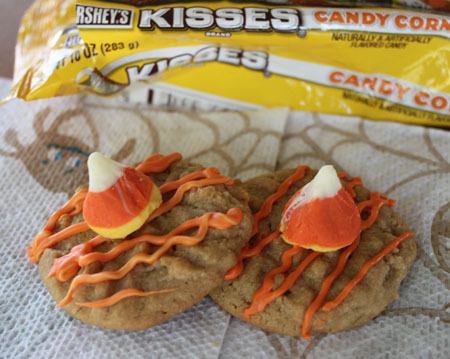 They’re not-too-sweet peanut butter cookies drizzled with melted Candy Corn Kisses with a whole Kiss stuck in the middle. They’re garish in a perfect way and believe it or not, they taste great. If you’ve ever had white chocolate with peanut butter, you know it’s a good combo, and that’s kind of how these taste, but the white chocolate has notes of candy corn flavor. Also, the Kisses melt really easily. Reading the recipe in the store, I was kind of worried about melting them in a freezer bag in the microwave, but I followed the Hershey test kitchen directions and didn’t have any issues. If you have a very high wattage microwave, you may want to use 40% power instead of 50. Okay, I feel like I’m getting ahead of myself. Here’s the recipe. The girls LOVED these. Below is a link to the recipe along with a photo of what the bag looks like. I found the seasonal Kisses at Target. 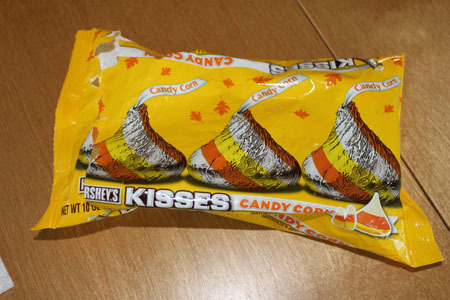 Anna, I remember when you mentioned these on my “Candy Corn” post. I still haven’t stumbled across them…but, will have to definitely check out Target! The texture of them looks different. Do they have the same ‘suggary’ taste of candy corn? I just can’t wrap my head around the idea, LOL! oh dear, those are super pretty. Oh, I needed this post since I’m doing cookies this week. Thanks so much for yet another great idea. Oh my gosh, these look epic! Nicole, they melt really well. You could make double chocolate cookies, melt the Kisses as directed in the recipe, then drizzle them on the double chocolate cookies. I just bought a bag of these at Target as well. they are so cute! However I need an alternative to the peanut butter cookie due to my son’s peanut allergy.. any suggestions?? I need to find some of those kisses. The cookies sound yummy! oh i use to love candy corn as a kid! these cookies sound so yummy! I tried those last year and we liked them. I just bought a bag of their new Caramel Apple Kisses. They taste exactly like a caramel apple with chocolate. What a good idea to use melted kisses as the drizzle.